American manned Mars expedition. Study 1983. Chemically-powered Mars flyby-rendezvous landing mission designed by SAIC under contract to the Planetary Society in 1983. Status: Study 1983. Gross mass: 460,000 kg (1,010,000 lb). The risky scenario involved only one chance for the crew to rendezvous and dock with an unmanned Earth Return Vehicle as it whizzed by Mars. The 1096 day mission would depart on 5 June 2003. In 1983 the Planetary Society commissioned the SAIC company to conduct a nine month study on a quick manned mission to Mars. The report was issued in September 1984 and envisioned a flyby-rendezvous mission which would require 18 shuttle launches to assemble a 160 metric tons of payload in earth orbit. It was assumed that Orbital Transfer Vehicles, a reusable upper stage in development by NASA at that time, would be available to boost the expedition out of earth orbit. Four crew would be accommodated in the 121 metric ton Outbound Vehicle, which consisted of four sub-vehicles: a 38 metric ton Interplanetary Vehicle; a 19 metric ton Mars Orbiter; a 54 metric ton Mars lander; and a 10 metric ton Mars departure vehicle. The Interplanetary Vehicle provided quarters during the flight to Mars and was based on shuttle Spacelab modules. The MO, MDV, and ML together constituted the Mars Expeditionary Vehicle and were enclosed in a 13-m-diameter aeroshell. Only the MEV would enter Mars orbit; the IV would be cast off on a flyby path. During most of the mission the crew would be kept at 1/5 to 1/4 G by rotating the elements of the vehicle at 3 revs/minute. The 43 metric ton Earth Return Vehicle would be launched separately, unmanned from the MEV and provide crew quarters for the return from Mars to earth. 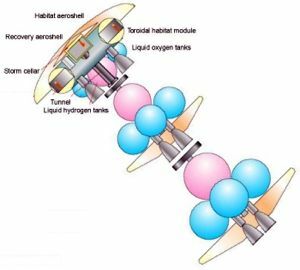 The ERV spacecraft would be boosted on its interplanetary trajectory on 5 June 2003 by three sequential perigee burns of Orbital Transfer Vehicles (a space tug NASA had in development at the time). The crew, aboard the Outbound Vehicle, would be launched on 15 June 2003. Seven OTV's would be needed for its separate departure. On 24 December 2003 the MEV would undock from the outbound vehicle and aerobrake into Mars orbit. Three crew would descent to the surface aboard the ML, provided with a pressurized rover for exploration of the terrain. After 30 days on the surface, the crew, together with 400 kg of Mars rocks, would rocket from into Mars orbit and rendezvous and dock with the MDV. The MDV would boost itself out of Mars orbit to rendezvous and dock in deep space with the ERV which would then be flying past the planet. 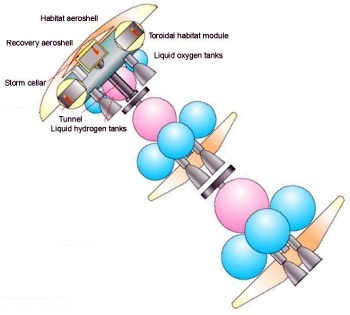 The crew would board a re-entry capsule as they approached the earth, cast off the rest of the ERV, and re-enter the earth's atmosphere for a recovery on land on 5 June 2006. SAIC recognized that this minimum-mass scenario was risky. Aside from the aerobrake maneuvers requiring precise navigation, there was only one chance for the MDV to intercept the ERV as it went past Mars. Any delay, and the intercept could not be made, and the crew would perish. Total cost of the expedition was estimated as $ 38.5 billion, of which $ 14.3 billion was in hardware, $ 2 billion in shuttle launches, and $ 18.5 billion in operations. This did not include the cost of developing the OTV (which was later cancelled by NASA). Summary: Proposal for manned Mars expedition using aerobraking and flyby/rendezvous to minimize mass. Family: Mars Expeditions. Country: USA. Agency: Planetary Society, SAIC. Bibliography: 591.